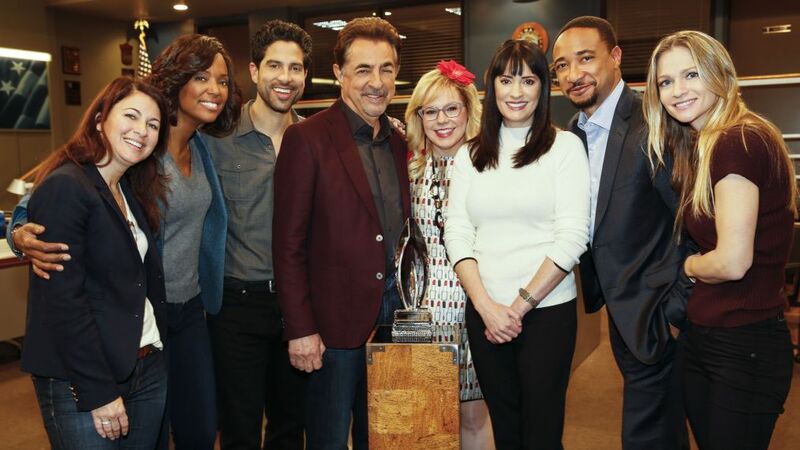 (l-r) Executive Producer Erica Messer, Aisha Tyler, Adam Rodriguez, Joe Mantegna, Kirsten Vangsness, Paget Brewster, Damon Gupton, A.J. Cook. Twelfth time's the charm, right? That's a logical conclusion given that it took nomination No. 12 for the long-running Criminal Minds to finally win the Best TV Crime Drama award at the People's Choice Awards a few weeks ago. The series, produced by ABC Studios and CBS Television, grabbed the honor and the cast (pictured above) assembled on the show's set in Los Angeles last week to celebrate the award. But there are bad guys to be caught and, all celebrating aside, it's back to business on this week's installment when a bizarre hieroglyph found on a deceased homeless man's body is oddly similar to previous casualties from years ago. Also, Reid (Matthew Gray Gubler) decides to take his mother (guest star Jane Lynch) out of a clinical study and bring her home with him, which doesn't go as well as he had hoped. TV Insider recently talked with showrunner/executive producer Erica Messer to get her take on not only the award, but on having Lynch return to the show. She also touched on what else is coming the rest of the season. Congratulations on the People’s Choice Award! Erica Messer: It's extra-special this year because we've been through a lot and the fans have stuck with us, and I think that was their way of letting us know "we still have your back," which is pretty fantastic. We've been nominated ever since the first season. That was back when I think the award was for Best New Crime Drama or just Drama. Prison Break won that year, but we were all there, ready and hoping that we would win. Ever since then we've been nominated but were like the Susan Lucci of crime dramas. We've had so many changes in the past year that I think it means even more to it this season. The first win after a dozen years! That’s just crazy! RELATED: Thomas Gibson Fired from Criminal Minds. What do you think attributed to it? Given the behind-the-scenes stuff this year, do you think the show is refreshed in some way? I think it is. It's sort of proving that 12 years into a series, you can still find fresh ways to tell stories, and introducing new blood into your characters can be a really great thing. Some of the things I don't think any of us would've ever predicted or chosen for what Season 12 would look like. But it's pretty rewarding actually to see that people are still behind it. I talked to Adam Rodriguez recently, and he’s been a great addition to the show. What does he bring to the show as Alvez? I think everybody said, "Oh, with Shemar Moore gone, you're going to need that kind of guy," meaning your tough guy who'll kick in a door for you, but Adam is so much more than that. Just as Shemar was so much more than the big brother type. For us, the tricky part for us was Morgan, played by Shemar, and Garcia (Kirsten Vangsness), had such an interesting relationship and was certainly a fan-favorite relationship, and we didn't want Adam's character to come in, and in any way, shape or form try to replace that. We kind of went opposite with it, where Garcia can't look at Adam and be like, "Oh, this schlub is here." I mean, she's going to look at him and be like "Why is this handsome guy here? I miss my Morgan." We just played with a really fun dynamic for them where she's trying really hard not to like the guy and he's so likable that she's finding that to be incredibly difficult. Knowing Jane Lynch was coming back, how did you go about shaping the episode? We've been trying to get Jane forever and ever and ever, and she's been so booked and busy, and she decided to take a little bit more of a break this year so we we're able to get her in a couple of episodes actually. The first one was [Wednesday's] episode, and we thought, "We can't have Jane Lynch back and not build a story around it." So that's what we did, and we built a big story around it. I think that episode really is a nice way to kind of show that layer to Matthew's character (Reid)—that he's this brainiac and he can solve all kinds of things, all sorts of problems and yet here's his mom, the thing he loves the most in the world, and he can't make her better. It was like watching a really good play when we were on set watching the scenes. I mean, they're so good together and Jane's just so lovely. What else is coming up the rest of the season? We have a big storyline coming up for the rest of the year with Mr. Scratch, who has been tormenting the team this year, so stay tuned for that. It'll be sort of a reward to all of those who have been watching for so long. The procedure is one thing, and everybody likes our battles of good vs. evil, but when we get to really dive into our heroes, then everybody seems to jump on board. Is the Mr. Scratch story something that'll get wrapped up by the end of this season, or will you play with for a while? We're sort of debating that. It feels like it could go either way, but I'm thinking if we get a Season 13 with 23 episodes, then that's episode 300. Maybe we keep Mr. Scratch around for a while. Criminal Minds, Wednesdays, 9/8c, CBS.